If you kill a king, expect swift retribution. Expect to not live long after you deal the final fatal blow to a royal personage. A boy, Pierre Basile, was executed on this date in 1199 for shooting King Richard the Lionhearted* with an arrow expelled from his crossbow. The wound wasn’t fatal to Richard I; the gangrene was. 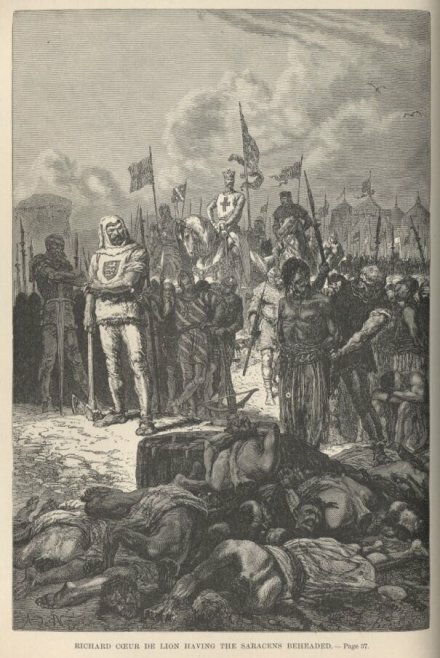 (French page) Although the king pardoned the boy for the shot before dying, Richard’s right hand man, French Provencal warrior Mercadier, would hear none of it. After the king’s death, Mercadier stormed Chateau de Chalus-Chabrol, defended weakly by Basile, then flayed him alive before hanging him. Little is known of the boy defender. Also known as Bertran de Gurdun and John Sabroz (the various names suggest we’ll never know his real name), Basile was one of only two knights defending the castle against the king’s siege. This castle protected the southern approach to Limoges and was betwixt routes from Paris and Spain and the Mediterranean Sea and the Atlantic Ocean. The English army openly mocked its defenses as the siege continued. The ramparts were cobbled together with makeshift armor. A shield was constructed out of a frying pan. Richard I, as feudal overlord, claimed it for himself and no boy knights were going to get in his way. The king had been in the area suppressing a revolt by Viscount Aimar V of Limoges. The viscount’s forces had been decimated by the king’s army. The riches for the win lay in the castle and Basile stood atop it. It was early evening, March 25, 1199, when Richard walked around the castle perimeter without his chainmail on. Arrows had been shot from the ramparts by Basile but were paid little attention. The king applauded when one arrow was aimed at him. The next arrow fired struck the king in the left shoulder near the neck. Richard the Lionhearted, mortally wounded. The king returned to the privacy of his tent to pull it out. He couldn’t. The surgeon Hoveden, Mercadier’s personal physician, was summoned. He removed the arrow, but not swiftly, or cleanly. Gangrene quickly set in. The king asked for the crossbowman. The boy, Basile, appeared before the stricken king, expecting to be executed on the spot. The boy spoke first, saying he had tried to kill Richard because the king had killed the boy’s father and two brothers. He ordered the boy set free and, further, sent him away with 100 shillings. Deliriously jubilant at the king’s decision, the boy quickly returned to the castle. 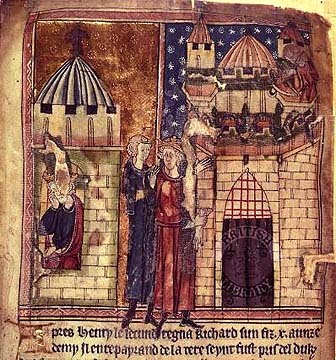 On April 6, in the arms of his mother, Richard I died. His remains were buried at the foot of the tower from which Basile shot the arrow. And with the king died his chivalry towards Basile. 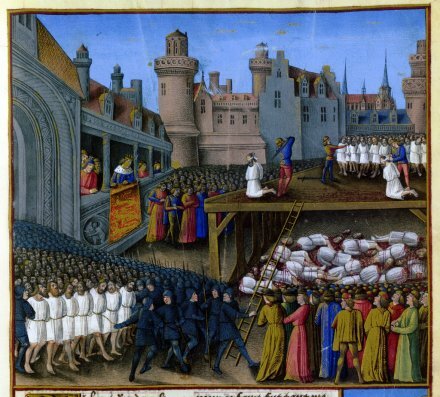 Mercadier, who had entered the king’s service in 1184 and fought in battles in Berry and Brittany, Flanders and Normandy, brought the castle’s defenders to a swift and punishing death. Hanging the defenders, he took the boy and flayed him first — that is, he removed the boy’s skin while he was still alive. Then Pierre Basile was hung, and his body consigned in an unmarked grave. * Last seen in these parts slaughtering Muslims on Crusade.